The goal with the app was to make users aware of their teeth-health and take better care of them. The client is Västerbottens Läns Landsting – Umeå University Institution of Odontology Department Of Cariology – for research purposes. After an initial brief meeting with the client we did a design document with all the features of the app. We also did some rough sketches of what the design could be like with these features. See the draft mockups of the design below. We designed the app with Cocos2D framework in xcode so we could push out both android and iOS versions. But the main focus was on the iOS device. The backend was coded with PHP which would store and send data to the app via our custom made API specific for the app. After installing the app the user would create an account which was stored in a mySQL database (apache server). The main usage of the app was for the user to submit data about their teeth care each day (or when possible) so we could collect valuable data over time. We came up with the idea to make gamification out of the ordinary and boring toothbrush events. Every day the user would get a reminder to brush it’s teeth. 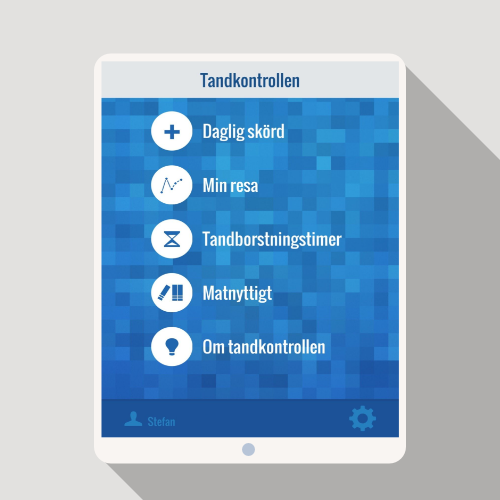 If they remember to brush their teeth with the brush timer (Tanborstningstimer) of the app the user would get experience. There is a “My journey” page which presents statistics over time (calendar) with data of how often the user had brushed it’s teeth. We also stored if it was done both morning and in the evening. If the user was brushing it’s teeth enough times in two weeks they got an awesome animation and a golden star. Each day the user also had the possibility to submit a form with some information about the daily intake of food, sugar etc. this information is also stored in the database. After the app had been iterated a few times we began beta testing with a small user group. The test builds were sent out to the test groups via the webb app TestFairy so we could get a good overview. The app is not officially released since it is a closed research project. We hope this gives you some insight into the process of developing an app for research purposes.